Born Standing Up by Steve Martin (audiobook) his memoir of his start in comedy highly recommend, especially if you are a fan. Dear Mrs. Bird by A. J. Pearce (library) reminiscent to me of the Guernsey Literary and Potato Peel Pie Society. It is set during the London Blitz. I liked it a lot. Lake Success by Gary Shteyngart (library) now this book, even though I did not love it...the prose, the writing was so good! Just his descriptions of a Greyhound bus station in the first chapters was MILES above the prose in Chaos. I felt a connection to his characters and I could suspend belief and get lost in the world he created with his words. And I did not feel more sympathetic to his characters than I did to Kay Scarpetta and her family in Chaos, his writing was just so much better. Even if you do not like the characters, you understood them and could figure out why they did what they did. 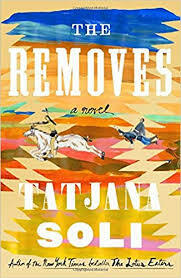 The Removes by Tatjana Soli (library) I really enjoyed this one About the Indians being REMOVED from their land. It follows the stories of Custer, his wife and a white woman who was taken into a tribe and her journey from surviving with the Indians until her liberation by Custer. Mortal Arts by Anna Lee Huber (library) I started reading this and realized it is the second in a series, there were some relationships that I would have understood better if I had read the first book first. However, I did enjoy this, there was a bit more romance than I usually like, but the basic mystery and plot was very interesting. PTSD back in the Napoleonic wars. Nine Perfect Strangers by Liane Moriarty (library) 9 people at a Spa Retreat to transform their lives. I really liked it. I have enjoyed all of this authors books. Homer and Langley by E. L. Doctorow (library) a fictional account of the Collyer Brothers (famous hoarders in NYC) Puts meaning towards their senseless accumulation of newspapers and trash. My Abandonment by Peter Rock (library) I really enjoyed this book, I think they made a movie based on it....follows a homeless girl in Portland OR living in Forest Park with her father. The Plot Against America by Philip Roth (library) this was a very interesting book to read in this day and age. Not a fun read, but a must read .....I think the Russians read it (it was published in 2004) and used it as a play book for today.